Madurai is the second largest city of Tamil Nadu and is situated on the banks of the River Vaigai. This holy city is believed to be one of the oldest cites ever to be inhabited in India. It is flanked on the north by the Sirumalai hills and on the south by the Nagamalai hills, thus giving it a natural appeal. The city gets its name from the word 'Madhura' which means sweetness. It is known by various other names such as the 'City of Four Junctions', 'Athens of the East', 'City of Festivals', 'Lotus City' and 'Sleepless City' as each of these names reflects a side of the city. It is a major pilgrimage hub as many temples are to be found here. Here is a guide to the city of Madurai. Click Here to avail the Best Hotel Deals in Madurai. The Alagar Kovil is a temple which has been in the name of the Hindu God, Lord Vishnu. The temple is located at the foothills of Solaimalai hill. The temple is famous for its delicate sculptures and carvings on stone. There is a magnificent statue of Lord Vishnu here which is carved onto a stone. There is a natural stream running close to the temple from which water is offered to the deity every day. It is said that Lord Vishnu lives in this temple as Goddess Meenakshi's brother Azhagar. This temple is a must visit for tourists and pilgrims alike. The Meenakshi Amman temple or Madurai Meenakshi temple is devoted to Lord Shiva and Goddess Parvati who is also known by the name Meenakshi. The temple is one of the most famous tourist destination and pilgrimage sites in Madurai as well as the country. Legends say that Lord Shiva visited the Goddess whose abode wasin this city, in order to marry her. 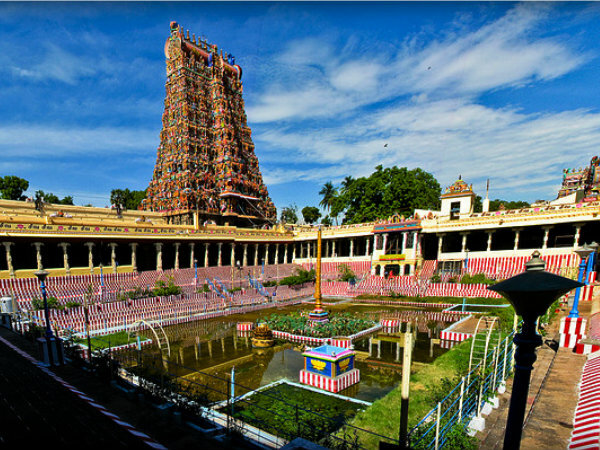 The temple is located in the south of River Vaigai and was constructed in 2500 AD. The present form of the temple was however constructed by the Nayaka rulers. The temple is famous for its marvalous architecture. The gateways of the temple are about 45- 50 meters tall and have images of gods and goddesses carved on them. There are 985 pillars and 14 towers in the temple. It is crowded by devotees who come here to seek the blessing of the Goddess. The Gandhi museum atMaduraiis one of the five in the country, and it houses several memorabilia of Mahatma Gandhi including his blood stained dhoti which he had worn on the day of his assassination. Several popular photographs of Gandhiji can also be found in the museum. This museum is situated in an ancient palace that belonged to Queen Mangammal who was a part of the Nayak Dynasty. After Gandhi's death, the palace was converted into a museum by the Gandhi Memorial Trust. The museum also has a bookshop which has a large collection of books on Gandhian philosophy and his life. There is also an open air theatre within the museum which organises cultural programmes, film screenings and various other programs. The Goripalayam Dargah is the largest mosque in the city and is located on the north of the Vaigai River. It is rumoured to have been built by Thirumalai Nayak in the 13th century and houses two tombs of a Muslim saint and a ruler named Hazrat Sulthan Alauddin Badusha and Sulthan Shamsuddin Badusha of Oman. The domes of this dargah are 70 feet in diameter and 20 feet tall and are built out of a single piece of stone. The inscription on the entrance of the dargah tells us about the period it belongs to. The main celebration in this mosque is the annual Urs Festival which is celebrated with pomp and grandeur. The Thirumalai Nayakkar Palace is a very beautiful palace constructed in the Indo-Saracenic style by the Nayak King Thirumalai Nayak in the 16th century. Today what remains of the palace is only one fourth of the original. There are about 248 pillars here which are nearly 58 ft tall. The palace ceiling carries paintings that depicts the lives of the Lord Vishnu and Lord Shiva. The palace is an architectural marvel and travellers coming here can see on display the various things such as furniture and utensils that were used here. The entrance to the palace, the dancing hall and main hall of the palace are the most beautiful pieces of work. Today the palace has a light and sound show which plays the life of the Thirumalai Nayakkar and Silapathikaram for the tourists coming here. Pazhamudircholai is a temple which is devoted to the Hindu God, Lord Muruga or Subramanya. The temple is located near the Alagar Kovil temple on top of the Solaimalai hill. The temple is one of the holy abodes of the Lord Subramanya. The idol of the Lord is carried on a golden chariot every evening during which time the devotees throng to the place. A natural spring Naburagangai is located close to the temple, and devotees coming here make it a point to take a dip in it. There are several sculptures and idols of the deity carved out in marble and wood inside the temple. Travellers coming here can explore the temple and admire its architecture. By Air: Madurai has a domestic airport which is about 10 km away from the city center. There are regular flights to Mumbai, Delhi, Chennai, Bangalore and many other cities. By Train: The Madurai Junction is a major railway station of South India. The station is connected to most parts of the country. Direct trains operate from Madurai station to many important cities such as Delhi, Chennai, Kolkata, Kanyakumari, Coimbatore and Bangalore to name a few. By Road: Several National Highways run through Madurai such as NH7, NH 45B, NH 49 and NH 208. Hence Madurai is easily accessible by road from several South Indian cites. State transport buses connect the city to several cities around Tamil Nadu. Private buses ply regularly to cities like Chennai, Coimbatore, Trivandrum, Tirchy and Bangalore.